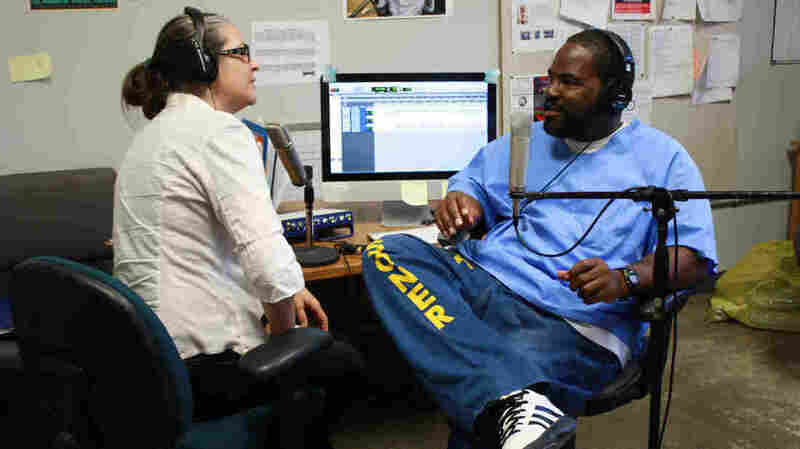 Behind 'Ear Hustle,' The Podcast Made In Prison Inmate Earlonne Woods and artist Nigel Poor have created a hit podcast from inside California's San Quentin State Prison. Ear Hustle tells stories of prison life, and is now in its second season. Earlonne Woods (left) and Nigel Poor are behind the podcast Ear Hustle, which is now in its second season. Nigel Poor and Earlonne Woods wanted to start a podcast about life in prison. 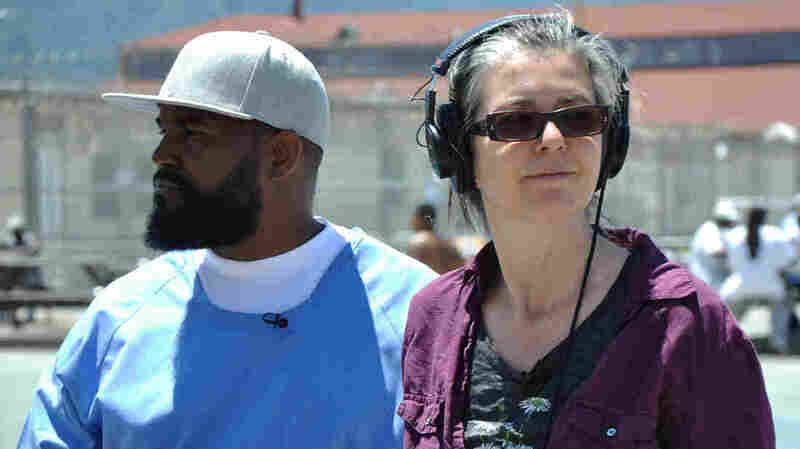 It would be for inmates, by inmates, to be played on the closed-circuit station in San Quentin State Prison in California — "for the inside," as Woods says. Woods is serving a 31-years-to-life sentence for attempted second-degree robbery. Poor is a visual artist who volunteers at San Quentin. When you're dressed in blue like them, yes, they will divulge. Poor says, "I think a lot of people, unless you're involved in the criminal justice system, the prisons are these invisible places. We don't know what happens inside of them. And so hopefully our stories make human the people that are in here." Working in prison comes with a host of obstacles. The studio is an echoey concrete room, with no phones or Internet access. There are constant interruptions — even when they were taping an interview with NPR. Ear Hustle is now in its second season, and — with help from prison officials — we finagled a way to talk with Poor and Woods from inside that makeshift studio. Woods: Well, I would say I've learned about different conversations that I didn't know nothing about. I don't know if I have learned anything different. Poor: Were you surprised, though, about how vulnerable people would be talking to us? Woods: Not really. I mean, some people, yeah, but for the most part, people love to tell stories. Especially if they're telling them to, you know, the right people. Some people be apprehensive about telling certain stories, probably, to the media. But when you're dressed in blue like them [other inmates], yes, they will divulge. Woods: Oh, we haven't even got to, like, Shakespeare, or artistic ensemble, or — there's a lot we haven't even touched yet. Poor: There's so much happening here. And San Quentin is a little bit different in that it has a lot of programs for people to do — it has a lot of volunteers that come in, so it's a very active community. Someone asked us if we'd ever run out of stories, and I think it's going to be a long time. Because as you said, it's very active in here; there's very rich and interesting and complicated lives happening. Woods: Some people probably haven't seen their family members in 15, 20 years, you know? So going out there, figuring out what you want to do, that's kind of interesting, you know? Like, do I kiss her on the cheek? Do I kiss her on the forehead? Do I kiss her on the lips? I don't know. 'Cause you know, you out of touch in that sometimes. So hearing his story, it was interesting — you know, it makes you think about your relationship with your own mother. Poor: We work really hard to set up an atmosphere of trust and comfort when we interview people. And we push people, too. I mean, we're not interested in pat stories with happy endings where people are just talking to us in a surface way. So we, I guess, demand a lot from the people we interview, and they trust us enough to respond in kind. Woods: I was at a symposium that a volunteer ... put together, and Sara Kruzan was in my group. And when she told her story, it was really powerful. And I just asked her, like, would you like to come in and talk about it? And we got to talking further, and we put together a little, pretty much, restorative justice with her and the other guy that's in the story. Ear Hustle's studio at San Quentin is an echoey concrete room, with no phones or Internet access. Poor: I think that it's important that we have true stories that come out — that we don't sugarcoat things — and that people take responsibility for the actions that got him here, or that got them here. And so for us, that story is a departure. But that is a big part about life inside prison. People need to talk about what got them, you know, the sentences that they got. And restorative justice symposiums happen here — I don't know on a regular basis, but they do happen here — and it's something that is a privilege to sit in on and see it working. Woods: It's actually those type of situations where you're sitting across from a survivor of a crime and you're having this open dialogue that makes you change, you know? Sometimes you need to sit there, 'cause when you're just in society, you may not look at a person that you victimize as a person. You may just look at 'em as something else, or — for money reasons, or whatever the case may be. But to actually sit down with 'em and have a conversation, it opens you up. It change your perspective on things, you know? It really do. Woods: I believe that Ear Hustle can show people that individuals are not just sitting in prison just sitting around. Hopefully we'll continue to show that — show the experiences of guys inside, continue to tell the stories. Poor: We hope that our stories are going to get people to think more clearly about crime and punishment and rehabilitation and what is the purpose of prisons and how can people who are incarcerated become contributing citizens and give back and continue to grow and challenge themselves so when they come back out to society, they're coming out ready to contribute and jump back in and change their lives. Kat Lonsdorf and Connor Donevan produced and edited this interview for broadcast. Patrick Jarenwattananon adapted it for the Web. In the audio, as in a previous Web version of this story, we incorrectly refer to Radiotopia as a distributor of podcasts. It is, in fact, a podcast network from PRX.